Break in – break out – save your brother’s life. This turns the final episodes 14-22 of the TV show PRISON BREAK season 1 into a 2h30 movie experience. The escape is finally happening. I am a true fan of Season One of Prison Break. Still I hardly ever watch the entire show, because it is that long. I find the idea of a TV show being turned to a movie fascinating and this show seemed perfect to try that, so I could enjoy it in an acceptable amount of time and maybe even very different to the original show. My goal was to create an action and suspense filled movie about a genius attempt to break out of a maximum security prison. At first my idea was to make ONE movie out of the entire first season, but this did not work, because too much important plot was involved to make the final escape happen. Characters needed introduction and interaction. Side plots were necessary for the main plot. So I decided to create more than one movie and put in each of them as much as possible to a) create an entertaining, fast paced movie and b) stay true to the show. 1) the show is heavily scored. If you cut somewhere, you always have to re-arrange or sometimes even create a new score to make it fit to the previous scene. Luckily I own the soundtrack and it sure helped a lot. 2) a TV show blends in the credits, when the show is running. Several scenes could not be dropped, where the credits are displayed. 3) TV shows air as episodes, which means that every episode has a beginning and an end, is a complete watching experience. In a movie it feels really strange, if it has an episodic touch. To get a continuity of the plot meant a lot of rearranging and sometimes restructuring of the scenes. I used quite some of the transitions that the show also uses, but a lot less of them. After the first try to escape has failed, the team around Michael Scofield has to think of another way, but it’s a suicide one. Time is never on their side and lots of things happen to prevent the escape. Two new team members join the escape crew, Abruzzi returns from the hospital and Bellick clearly senses that something is going on. The finale Of Prison Break season 1 is one long lasting thrill ride. Creating a movie from these events required a lot of careful handling about what could be included into the plot and what not. Again a huge part of the original is the conspiracy, trying to blame Lincoln Burrows for a crime he did not commit. Most of these events take place outside of Fox River, but some directly affect the actions inside of the prison. To create a working plot that continues the two other movies was a very difficult thing to do and required a lot of restructuring. Episode 16 of season 1 is flashback episode showing the pasts of the escape crew, which was completely dropped. Episode 22 was all about the escape after the prison break. Only some very few elements of that were used, because I wanted to end the movie with the escape and not with a cliffhanger. The most difficult part of the edit was about Sarah Tankredi. In The original show, she was given information about Lincoln’s innocence, which then made her help Michael to go on with the escape. But since she never gained that knowledge in the movies, I was forced to find a very different way for the escape to succeed. In the end I actually prefer my way. With 2h33 Episode 3 is rather long, but I could not drop much more without destroying the plot or the mood. - again all the conspiracy plot is completely gone. This also includes the meeting between Lincoln and his father and all the events around LJ Burrows. 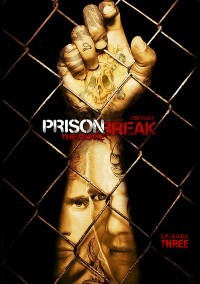 - the escape after the prison break is almost gone at all. There was too much drama in it and it all pointed towards a cliffhanger for season 2. - the real estate events are kept very short. Geary tries to sell Scofield’s cell, but C.Noe and T-Bag are not joining this stupid poker game in the prison kitchen. - Sarah does not receive any information about Lincoln’s innocence, so she also does not talk to her father about it. - several scenes about Michael’s insanity were removed because they were over the top. If he was planning to be sent to psych ward, he would not have gone that far. Most of these scenes were meant to confuse the audience about Michael’s state of mind. - removed Sucre hiding from the guard, when he fills the hole. That scene was one of the typical “he almost got caught scenes” and felt a bit too much like a TV show. - removed some of the scenes with Bellick and Tweeneer. There were too many of them. - Michael just takes the pills in psych ward unlike in the original, where he starts a senseless discussion and is finally forced to take them. - removed C-Note not getting his savings from his friends. He received a terrible beat-up for that as well (removed, but the bruises in his face clearly show in the movie, yet are not explained). Since I wanted to drop that stupid poker game, C-Note had to be able to get his money right ahead. - reworked the scene with the stolen keys of Sarah. This time she does not have the lock exchanged. Toughest editing job for this movie. Sarah still acts cold towards Michael, but most of all, because he is behaving so strange. A lot of drama had to be removed, since her trust was not broken. This final part of CBB's trilogy is as thrilling as the previous two. The audio and video editing continues to be brilliant and the effort to merge, remove and streamline subplots is astounding. Any fan of Prison Break will enjoy this, I dare say. My only gripe is the epilogue. Granted, I refrained from watching it through to the end due to possible spoilers from later seasons. From what I saw, however, the epilogue felt unnecessary and, as nascent points out, a bit rushed. Overall, a tremendous work and highly recommended to anyone seeking a 6hr+ on-the-edge-of-your-seat experience! I've now finished the 3rd part, watching it with the same audience of people that had seen the original series, and people that hadn't. Everyone was extremely satisfied with this whole project, I shall never watch the show in any other way again. This fanedit is perfect, and I shall watch it again in the future numerous times I'm sure. You editing is perfect, the only flaw could could find was a single credit "Directed by" in the middle of the film, but it didn't distract, and I am aware that you had to use footage from credit sequences, it is unbelievable to me how you've managed to use so little of the credits in this project. You narrative and linearity is exactly as I would've wanted had I made this edit. I know it's nitpicking, but out of everything in this entire project it's the only thing I'd modify, all your editing and story telling was fantastic, but the text was just grammatically awkward. Also the epilogues were very fast, it gave little time to actually read each and think about each character's story arc. I hope it doesn't sound harsh, I'm just trying to be as critical as possible, and let's face it, this is a masterpiece in movie fanedits. You've taken a messy and awkwardly told Tv season which was rewritten from a mini series to be a crappy 4 season long episodic tv series that got so bad I couldn't stand it. But you've taken that show and made a fantastical well edited story with brilliant narrative, and no loose ends, that I have been recommending to everyone. I've said it in my other reviews but I wish you'd do this for Lost season 1 and Dexter season 1. Two other shows that started brilliantly and fell apart. Although I know that is a lot of work. Thank you so much for your work on this project. You've created and built something masterful here. Out of around 7 hours of finished video, you've pretty much made perfection that I find few faults for.